In this presentation, the great Daniel Dennett explains how comprehension is often not a prerequisite for competence. In nature, comprehension is not the cause of competence but the effect. Natural selection, over many generations, shapes characteristics into organisms which makes them competent without them realizing why they are competent. There is no evolutionary advantage to shape understanding into the organism of why the characteristic is so beneficial; the characteristic itself is enough. "Your butterfly that has eye spots on its wings does not have to understand why this is a good thing for it to have. It scares off the birds but it is none the wiser." Does this principle only apply to organisms? No, it also can apply to artifacts made by organisms. Of course, comprehension can precede competence. Daniel gives the example of the Catalan Spanish architect Gaudi who was extremely competent and knew exactly what his cathedral should like before the first stone was laid. 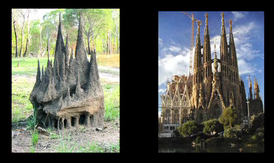 But individual termites, in nature, mindlessly perform some simple tendencies that were shaped into them by evolution and, together, manage to build something amazingly similar (to compare, see picture on the right). A nice example of competence without comprehension which Dennett gives, is how Polynesian boats are developed and improved "Every boat is copied from another boat ... it is the sea itself who fashions the boats, choosing those which function and destroying the others." "If it comes home ... copy it! That's natural selection." How does this relate to the solution-focused approach? Doing what works is one of the key principles of the solution-focused approach. One assumption we have is that understanding why something works is less important than knowing it works in the first place. Often, we identify things that work, and we can use them, but we are not completely sure why they work. We may have some ideas about why something works, but sometimes we may have no clue at all. Still, this does not keep use from doing what works. I think that often we can do something that works without knowing why it works. However, understanding why something works can often help us improve it. Hi Rodney, I agree. Maybe good to add that the post was not intended to put down understanding. As the Gaudi example shows, comprehension can help make designs better and better. The aim of the post was to counter the intuition that before you comprehend you cannot be competent. I agree. I think that sometimes we develop the understanding about how to produce results as we go. Sometimes it's inductive trial and error and sometimes it's deductive. And with career I definitely agree. How can someone know what they want to do with their lives without trying different things to see what they like?